Q: Why do I get the error – Desired Current/Voltage Cannot be Applied? During testing of fuel cells, sometimes current cannot be successfully applied. This leads the researcher to question whether there is a problem with the fuel cell or the test station. This document describes some basic checks and tests to verify the functionality of the test station when used with a typical single PEM fuel cell. The user should first verify that the fuel cell is attached with large gauge wire to the test station’s ‘+’ and ‘-’ load terminals. Normally, 4 gauge (4 AWG) wires are used for a test system operating at up to 50A and 0 gauge is sufficient for test stations with 100A capacity. Special cables are available from Scribner Associates for testing large cells at currents of up to 500A. See the test station manual for connection diagrams and instructions. The cell Sense + (red) and Sense – (black) small leads should also connect to the cell fixture terminals. The user should verify that the anode and cathode flow rates are set sufficiently high to provide the cell with the fuel and oxidant it needs. For a flow-through cell (the typical configuration for single-cell testing), a stoichiometry ratio of greater than one is required since some fuel and oxidant is not consumed by the fuel cell. Inadequate fuel supply settings can result in a reasonable cell voltage under open-circuit or light load conditions but a cell voltage collapse when current is increased. If cell connections and fuel supply settings are verified to be correct but the fuel cell will not support a current applied, the following test can determine if the problem is with the fuel cell or test station. This test can be helpful if the cell cannot even operate at 1A or 2A in constant-current mode without triggering a low voltage shutdown alarm. First, disconnect the cell cables and sense leads from the fuel cell (keep them connected to the test station). The fuel supply and exhaust hoses and cell heater and thermocouple wiring can remain attached to the fuel cell. Next, connect the cell cables and sense leads to a fresh (new) alkaline D cell battery as shown in Figure 1. Use rubber bands or a battery holder to secure the main terminals and sense leads to the battery with the red wires on the positive ‘+’ end and the black wires on the ‘-‘ end of the battery. It is not necessary to connect the green and white sense wires for this test. Start the FuelCell software and click Apply Fuel and Apply Load. Squeeze the terminals against the battery to ensure they make electrical contact and note the cell voltage (whole cell) reported by the software. For a new battery, it should be about 1.5 to 1.6 volts. Set the Current slider in Background to 1A. The Current display should stabilize at 1.00. The cell voltage should drop to about 1.2-1.4 volts for a typical battery. The battery should be able to supply a 1A current for several minutes, although the cell voltage will slowly drop. Next, set the current to 5A. It should be possible to get this amount of current from the battery for at least a short time. A typical cell voltage under this condition may be 1.1 to 1.4 volts. Click Stop Load and Stop Fuel. If the test station applied a 1A or 5A load to a battery and there are no problems with the anode and cathode fuel supply, the test station will also be able to apply the same load to a fuel cell. If the fuel cell will not operate at these currents, there is a problem with the fuel cell. If the battery test does not work as described, there may be a problem with the test station and Scribner Associates should be contacted for technical support. The 850 operates in constant voltage, current, or power mode. The software can record cell power in addition to voltage, current, and other data. The minimum power level that can be entered in constant-power mode is .01 watts and can be changed by the user. The data files produced by our software use scientific notation and show four digits after the decimal point. This means that for power levels over 1 watt and less than 10 watts, the smallest digit represents hundreds of microwatts. Instructions on making and working with Swagelok stainless steel compression fittings (pdf). The following material was sourced from Swagelok and is the property of Swagelok Corporation. How do I set up dual fuel cell configurations (PEM/DMFC cells)? This document describes the installation of a single 850/890 test system that can be used for either PEM or DMFC configurations. The FuelDual program described below is typically used to attach multiple 850/890 test stations to a single computer. In this case, it will be used to create multiple independent configurations for a single station. Multiple startup icons will be placed on the desktop so that the system can be started in PEM or DMFC modes. Install the latest FuelCell release and test the system using the PEM hardware. Install FuelDual by running the downloaded executable on a machine that has FuelCell and a GPIB interface installed. Follow the installer directions carefully! Destination Directory: Use the default setting (C:\FuelCell) unless the FuelCell program has been installed in a different location. Define Station #1: Select a new Station Name for the existing configuration, for example FuelCell-PEM. The GPIB Address and Reformer GPIB Address should match the existing configuration and should not be changed (the defaults are GPIB Address 7, Reformer GPIB Address 0). Define Station #1: Select a Station name for the new configuration, for example FuelCell-DMFC. Set the GPIB Address and Reformer Address to exactly match those used for Station #1 (normally 7 and 0). Start the FuelCell program using the FuelCell-DMFC icon and use File | Instrument Configuration… to select the fuel control hardware that is used for this configuration. Note: The FuelDual installation process described above will create 2 identical, but independent software configurations. Each configuration is accessed by starting the FuelCell program using the appropriate icon on the desktop. Repeat above steps for each hardware configuration you wish to accommodate (if different test systems are being configured – different serial numbers – then the fuelcellx.ini and reformx.ini files will need to be created for each serial number, and not copied from the original fuelcell.ini file). The 890C, 890CL, 890e, 850C, and 850e model instruments support the use of a Gilson Minipuls 3 peristaltic pump for supplying anode liquid fuel to a DMFC or similar type of fuel cell. Before using this pump, the system needs to be configured and the user needs to understand issues involved with the use of this pump. These instructions assume that the user has successfully installed the instrument and FuelCell software and configured the unit for normal operation with a PEM fuel cell using anode and cathode gases. The Minipuls 3 pump operates at a maximum pump head speed of 48 RPM. The resulting maximum flow rate is determined by the type of tubing used and the pump head that the pump is equipped with. Consult the Minipuls3 manual for information for flow rates with various pump head, pump speed, and tubing type combinations. After selecting a pump head and tubing, determine the flow rate when the pump is running at maximum speed (48 RPM). This can be done by filling a graduated cylinder from a water container and timing with a stopwatch or by connecting a commercial precision flow meter to the pump. Note that any back pressure on the pump outlet presented by the fuel cell may affect the flow rate, so the flow should be measured under conditions as close to the actual cell setup as possible. Make a copy of the file “fuelcell.ini” in the FuelCell working folder (usually “C:\fuelcell”). Name this copy “PEM fuelcell.ini”. This file will contain the previous instrument configuration when used with anode and cathode gases and can be used to restore the test system to this configuration later. Start the FuelCell software. Enter the “File>Instrument Configuration” menu and specify the instrument’s serial number when prompted. In the “Fuel Configuration” tab, select “Liquid Pump” for Anode Fuel Flow Control Type. For “Full Flow of Controller”, enter the flow rate (in liters per minute) from the previous step. See Figure P1. Set the Offset Control Signal and Minimum Control Signal values to zero. Set “Controller Channel” to “Reform #1”. Click OK and select the option to save the settings. Close and restart the FuelCell software. Turn on the pump’s power switch. Ensure that both ends of the tubing are in a container of water and press the forward button on the pump. Ensure that the display reads “48.0”, indicating that the pump is operating at full speed and that the pump head is turning. Press the Stop button and ensure that the pump stops turning. For 850C and 850e models, connect the included cable from the 850C/850e Auxiliary Signals connector to the green connector on the rear panel of the pump. For 850C/850e models with an Interface Box option or 890C/890CL/890e models, connect the included cable from the “MFC R1” connector on the interface box to the green connector on the rear panel of the pump. Note that these are two different cable assemblies based on the instruments used and the correct cable must be specified when the equipment is ordered. In the FuelCell software, click the Setup Fuel menu. Set the Anode Minimum Flow parameter to the flow rate measured with the pump operating at 48 RPM. Set the Anode Load Based Flow parameters to zero. See Figure P2. If the Enhanced Setup Fuel menu appears, click Fixed Flow for the Anode side and set it to the measured flow at 48 RPM. Note that depending on the software configuration, this will be either units of “cc/min” or “L/min”. Click OK. Click Apply Fuel and verify that the pump runs at full speed (48 RPM). Enter the Setup Fuel menu and set the Anode Minimum Flow parameter to ½ of the flow rate measured with the pump operating at 48 RPM. Click OK. Verify that the pump runs at a reduced speed and that the display on the pump reads between 23.0 and 25.0. Click Stop Fuel and verify that the pump stops. Change the Setup Fuel menu parameters as needed for the experiment performed. When finished with the test station after closing the software, turn off the power switch on the rear of the pump. Review this linked PDF file for a description of how Scribner Associates Inc. products can be used to fully automate crossover and ECSA cell testing. The document outlines how to attach two fuel cell systems (the 850 and / or the 890) to a single computer. What is the pressure of the gas supplied from the fuel cell test stand to the cell fixture? The pressure of the H2/Air supplied to the fuel cell is nominally ambient unless back pressure is applied with a back pressure unit located downstream from the cell fixture. The pressure is nominally ambient because some back pressure can be generated in the cell fixture itself if the flow path is quite restrictive and the flow rate is high. All of our software products are available for download from our Software pages. Software upgrades to existing customers are free with the exception of some VERY OLD copies that require an updated dongle to operate. Q. I have a USB software key installed, but my program gives a “key not found” or “”key not authorized for this product” message. The LED in the software key may be flashing. A1. Connect the key to a different USB port on the computer, and retry the program. A2. The driver for the USB key is not correctly installed. Use the following procedure to reinitialize the driver. NOTE: Administrator privileges may be needed to install software. This may include CorrWare, CorrView, ZPlot, ZView, or MultiStat. Versions can be checked by choosing Help | About from inside any of the applications. 2a) Close all applications. Connect the key to the PC. 2b) Start the Windows device manager. 2c) Locate the ROCKEY listing as shown below. Note that it may be listed under “Other”. 2d) Highlight the ROCKEY listing and choose Action | Uninstall. NOTE: This does NOT remove software from the PC. It only resets the driver configuration. If ROCKEY4 is listed multiple times, uninstall the ROCKEY4-USB items first, and then uninstall any other ROCKEY4 items. 2e) Disconnect the USB key. 3a) Go to C:\SAI\Programs (the default location of the Scribner Associates applications). 3b) Run the program Rockey4.exe and follow the prompts to re-install the driver. NOTE: If you have an older version of the Scribner programs installed, the Rockey4 program may not be present. Run the KeyInstall.exe program instead. Choose Uninstall and then choose Install. 4) Reboot the computer and then connect the software key. The LED in the software key should be on continuously (not flashing). Start CorrWare/CView/ZPlot/ZView/MultiStat and choose Help | About. The serial number of the software key should be displayed. If the serial number is displayed, the software key is fully installed and ready to be used. If this doesn’t work, does the key work on other computers? Is it a USB key or an old parallel port key? Does the LED in the key flash or is it steady? While performing EIS measurements, is the sample geometric area considered by the software before showing the results? Q: While performing EIS measurements, is the sample geometric area considered by the software before showing the results? A: In ZPlot, the ‘Setup | Cell…’ screen has a Surface Area setting. If a value is entered, the data is scaled so that it is [Ohm*cm2]. This is done for the anode and cathode separately. Specific humidity (SH) is the mass of water vapor present in a given mass of gas, e.g., kg water vapor / kg dry gas. Relative humidity (RH) is the amount of water vapor present in the gas compared to the amount that could be present in the gas at the same temperature. Thus, RH = SH / saturation SH x 100%. Alternatively, relative humidity is calculated as the fraction of water vapor pressure in the gas (pv) relative to the saturated water vapor pressure (pv,sat) at that temperature: RH = pv / pv,sat x 100%. Water vapor pressure is the partial pressure due to the water vapor in the humid gas mixture. Dalton’s Law of partial pressures states that the total pressure in a gas is the sum of all the partial pressures of the constituents. Ideal or near ideal gases occupy the same volume for the same number of molecules (at the same temperature and pressure). So, the fraction of water vapor pressure relative to the total pressure is the same as the fraction of water molecules relative to the total number of molecules. Multiplying the amount of water and other (carrier) gasses by their respective molecular weights bring us back to specific humidity. Conceptually, relative humidity is an indication of how close a gas is to being saturated; a gas with 100% RH is saturated in water vapor. Note that specific humidity is unaffected by temperature whereas relative humidity can be changed by changing the temperature of the gas and/or quantity of water vapor present in the gas. Relative humidity is empirically useful because most materials respond, absorb or adsorb in proportion to relative humidity rather than specific humidity. Specific humidity is useful when considering chemical equilibrium because it is related to the absolute amount of water vapor in a gaseous mixture. Dew point (sometimes spelled dewpoint) is the temperature at which the gas will become saturated. Dew point is a direct measure of vapor pressure (pv) expressed as a temperature. The dew point temperature is always less than or equal to the temperature of the gas. The closer the dew point is to the temperature of the gas, the closer the gas is to saturation and the higher the relative humidity. If the gas cools to the dew point temperature it is saturated in water vapor and the RH is 100 %. Condensation will occur on any surface cooled to or below the dew point of the surrounding gas. Dry bulb temperature is the commonly measured temperature from a thermometer. It is called “dry bulb” since the sensing tip of the thermometer is dry (see “wet bulb temperature” for comparison). Since this temperature is so commonly used, it can be assumed that temperatures are dry bulb temperatures unless otherwise designated. Wet bulb temperature is roughly determined when air is circulated past a wetted thermometer tip. It represents the equilibrium temperature at which water evaporates and brings the air to saturation. Inherent in this definition is an assumption that no heat is lost or gained (i.e., adiabatic system) and the heat loss due to evaporation is balanced by thermal conduction from the air. In practice only carefully constructed systems approach this ideal condition. Wet-bulb temperature differs from dew point. The latter is the balance point where the temperature of liquid or solid water generates a vapor pressure (a tendency to evaporate) equal to the vapor pressure of water in the gas so that no net evaporation occurs. Therefore the dew point is always lower than the wet bulb temperature because at the surface temperature of the wet bulb the water must evaporate to maintain a cooling rate whereas at the dew point temperature the water must be so cold that it will not evaporate (but not so cold that condensation occurs). Methods for measuring humidity – Common approaches employed to measure humidity and dew point temperature are described below; pros and cons of each are summarized in the table below. • Wet bulb: In the wet bulb method, water is allowed to evaporate and so cool itself to the point where the heat loss through evaporation equals the heat gain through thermal conduction. This method usually involves a wicking material to bring replacement water to the wet bulb, a sufficient wicking distance (with evaporation) to achieve temperature equilibrium for the replacement water, sufficient gas flow rate and precise temperature measurement. • Polymer humidity sensor: The operating principle of solid state humidity probes is measurement of some material property of a water-sensitive material. Polymeric materials are generally used for this type of moisture sensor. Water vapor permeates the plastic and changes its electrical properties such as dielectric constant or conductivity. Sorption or desorption of water from the polymeric material occurs as the humidity of the surrounding environment changes. The change in the materials property are measured and converted to various humidity-related values using established calibration data. • Chilled mirror: In this approach, a sensor head is heated to a temperature well above the expected dew point and a mirror within the sensor is cooled until dew just begins to form on its reflective surface. An optically-controlled servo loop controls the mirror temperature so that the dew neither evaporates nor continues to condense (i.e., the definition of dew point). The temperature at which this equilibrium occurs is measured as the dew point. The chilled mirror technique is a first principles method meaning that the dew point is measured directly as opposed to via correlation of some other measured parameter to a response (calibration) curve. • Optical: In this method, light of specific frequencies is passed through a cavity of known dimensions. Water vapor absorbs some of the light and the decrease in transmitted light is measured. The reduction in transmitted light is then correlated to the amount of water in the path of the light, and from this the various parameters related to water vapor content of the gas can be calculated. Flow Rate = (Gas Stoichiometry Constant)(Current in Amps)(Number of Cells in Stack)(Stoichiometry Ratio). The Gas Stoichiometry Constant, in standard cubic centimeters per min (sccm) or standard liters per minute (SLM), is the mass consumption rate of the gas required to sustain 1 Amp of current at standard state conditions. The Gas Stoichiometry Constants are: hydrogen (H2) = 7 sccm; O2 = 3.5 sccm; and Air = 16.7 sccm for standard state defined at 0 oC and 1 atmosphere. The Stoichiometry Ratio is the ratio of the actual mass flow rate to the mass consumption rate. Typical Stoichiometry Ratios are 1.1 to 1.5 for H2 and 2 or more for Air, although there are cases where much higher values are used (e.g., when performing electrode kinetics and catalysis studies where it is desirable that mass transport effects are negligible). Sample calculation: a 25 cm2 single cell operating on H2 and Air will generate about 1 Amp/cm2 or 25 Amps. (Higher current density up to ~ 2 Amp/cm2 can be realized when using O2 instead of air). Using the above equation, the required H2 mass flow rate = (7 sccm/A/cell)(25 A)(1 cell)(1.0) = 175 sccm (@ Stoichiometry Ratio = 1). Generally it is a good idea to provision for running Stoichiometry Ratio of 3 or 4 (delivering to the fuel cell 3 to 4 times the amount of reactant than is required by the chemical reactions) which modifies the equation to: (7)(25)(1)(4) = 700 sccm (@ stoich ratio = 4). The nearest standard MFC size is 1000 sccm (1 SLM). Cathode flow requirement when using Air is = (16.7 sccm/A/cell)(25 A)(1 cell)(4) = 1670 sccm (@ stoich ratio = 4). The nearest standard MFC size is 2000 sccm (2 SLM). How do I choose a fuel cell testing station? There are many details to consider when choosing a fuel cell test station. An important consideration is the nature of the research you wish to accomplish. If the goal of the research is to perform fundamental science and engineering analyses, such as evaluating new materials and components, electrode designs, etc., then a system for analytical capability is required. Important features of such a system include the performance (accuracy, stability, precision) of the control and measurement system. In fuel cell testing, this includes environmental and reactant control (flow rate, dew point/humidity, cell temperature, pressure, etc.) and electrical measurements (voltage and current). In addition, the instrumentation should have the capability for state-of-the-art analytical methods, such as continuous, real-time cell resistance measurement by Current Interrupt (iR) and High Frequency Resistance (HFR), Electrochemical Impedance Spectroscopy (EIS), and controlled voltage/current/power scanning, cycling, etc. Collecting data is only half of the challenge. Verifying the integrity and significance of the data is also important. The quality of the data is only as good as the quality (accuracy, precision, etc.) as the equipment used to make the measurement. Repeatable and accurate humidity streams, cell fixture design and cell assembly, humidifier water quality, and other external conditions can affect the performance of the cell and the validity and quality of the research data. For highly analytical testing, it is very important to consider and control all parameters of the testing setup. 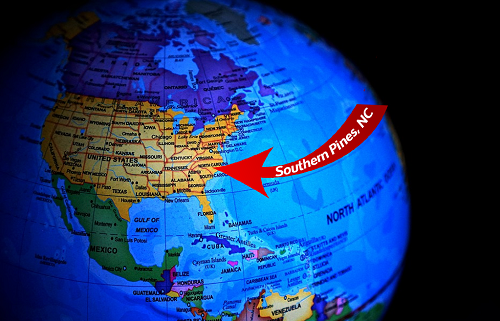 This is the type of experience and expertise that Scribner Associates is known for. It is also what we rely on when developing and marketing our test stations. For example, Scribner’s multiple current range electronic loads allow the researcher to match the current range of the load with the electrical current of the fuel cell. This increases measurement accuracy. The current accuracy of the electronic load is 0.3% of the full scale (FS) range (e.g., 0.015 A for a 5 A FS and 0.15 A for 50 A FS setting). Therefore, the closer the load rating is to the expected performance of the cell or stack under test, the more accurate the results will be. Mass flow control and humidification systems may also be subject to unacceptable accuracy errors if not sized correctly. This is why it is difficult to perform testing on both low power and high power applications with one test system. It is more costly to build/buy a single test system capable of high performance on widely different power scales than it is to purchase two test systems each properly sized for the desired application. Scribner’s products are engineered solutions, unlike some competitive products which integrate off-the-shelf general purpose components not designed for fuel cell testing. Scribner designs, tests and manufactures as many of the functional components of the system as is feasible to maximize performance and features, such as current interrupt (iR) and integrated EIS/HFR, that are important to the fuel cell researcher. Testing which focuses on more functional parameters of fuel cell assemblies (most stack testing) has different needs that should be considered. Stack testing may require monitoring the electrical performance of each cell as well as multiple temperatures. Scribner Associates offers a stack monitor system for monitoring electrical performance of cells in a stack, as well as a data acquisition instrument to collect other temperatures and/or voltages for stack testing. Scribner specializes in purpose-built electronic loads for fuel cell testing (890s) and integrated fuel cell test systems (850s) for single cell and small stack testing. We offer test loads up to 1kW/250A/50V with air cooling, and up to 3kW/500A/20V water-cooled systems. These test loads use the same FuelCell software as our 850 series units, and have an interface box for connections to fuel handling and safety equipment as designed and provided by the end user or system integrator. Tubing – Recommend tubing materials include new and clean stainless steel 316L, polypropylene (PP), high density polyethylene (HDPE), or flouropolymers such as polytetrafluoroethylene (PTFE), perfluoroalkoxy (PFA) or fluorinated ethylene propylene (FEP). Do not use Nylon or polyvinylchloride (PVC). Do not use tubing that is old, soiled, moldy or that has been exposed to chemicals. Reactant and purges gases – Use ultra-high purity (UHP, 99.999%) hydrogen, nitrogen and oxygen. Medical grade air is acceptable. NOTE: Do not use grease or oils on compressed gas regulators or fittings! Fuel cell components including membrane and membrane electrode assembly (MEA) – Check the source. If bought from an MEA vendor, ask about potential sources of contamination. If made in-house, is there a possibility of contamination for source materials, or process chemicals and fabrication steps? Contaminated fuel cell hardware – Make sure all gaskets and hardware are cleaned in solvent (methanol or ethanol) and rinsed in high purity water. Wear powder free latex or nitrile gloves when handling cell hardware components during assembly and disassembly. A cyclic voltammetry (CV) sweep commonly used for electrochemical surface area (ESA) analysis can be used as a diagnostic for impurities and / or electrode degradation. (Experimental conditions are described in the literature.) Does the electrochemical surface area decease after testing? Look for additional peaks not associated with the hydrogen adsorption/desorption process that may decrease in size with repeated CV cycles but that return after running the fuel cell. After running the CV scan, you may see a recovery in the performance of the fuel cell, which is another indication that the source of the degradation is an impurity removed during the CV experiment. Note that the impurity could occur on the anode, cathode or both electrodes, and/or the membrane. We have seen such behavior before and it was eventually attributed to substandard water used in the humidifiers. Increase in the ohmic resistance of the fuel cell, as measured by current interrupt or high frequency resistance, during operation under constant operating conditions (flow rate, temperature, humidity and pressure) is an indication that the degradation in cell resistance may be a result of a decrease in the ionic conductivity of the membrane. Ionic conductivity can be compromised by contamination with ions, in particular cat-ions that replace the protons in the membrane. What are the fire and explosion hazards associated with compressed gases? Flammable gases can burn or explode under certain conditions. Flammable gases include acetylene, butane, ethylene, hydrogen, methylamine and vinyl chloride. The concentration of the gas in air (or in contact with an oxidizing gas) must be between its lower flammable limit (LFL) and upper flammable limit (UFL). The LFL and UFL are sometimes called the lower and upper explosive limits (LEL and UEL), respectively. The LFL of hydrogen gas in air is 4% and its UFL is 75% at atmospheric pressure and temperature. This means that hydrogen can be ignited when its concentration in the air is between 4% and 75%. A hydrogen concentration below 4% is too lean to burn whereas above 75% it is too rich to burn. The flammable range of a gas includes all of its concentrations in air between the LFL and UFL. The flammable range of a gas is widened in the presence of oxidizing gases such as oxygen or chlorine, and by higher temperatures or pressures. For example, the flammable range of hydrogen in oxygen gas is 4% to 85% and the flammable range of hydrogen in chlorine gas is 4% to 89%. For a flammable gas within its flammable limits in air (or other oxidizing gas) to ignite, an ignition source must be present. There are many possible ignition sources in most workplaces including open flames, sparks and hot surfaces. The auto-ignition or ignition temperature of a gas is the minimum temperature at which the gas self-ignites without any obvious ignition sources. Some gases have very low auto-ignition temperatures. For example, phosphine’s auto-ignition temperature of 100 °C (212 °F) is low enough that it could be ignited by a steam pipe or a lit light bulb. Flash-back can occur with flammable gases. Many flammable compressed gases are heavier than air. If a cylinder leaks in a poorly ventilated area, these gases can settle and collect in sewers, pits, trenches, basements or other low areas. The gas trail can spread far from the cylinder. If the gas trail contacts an ignition source, the fire produced can flash back to the cylinder. • other oxidizable substances such as hydrazine, hydrogen, hydrides, sulphur or sulphur compounds, silicon and ammonia or ammonia compounds. Fires or explosions can result. The normal oxygen content in air is 21%. At slightly higher oxygen concentrations, for example 25%, combustible materials, including clothing fabrics, ignite more easily and burn much faster. Fires in atmospheres enriched with oxidizing gases are very hard to extinguish and can spread rapidly. Oxygen itself is not flammable but strongly increases the combustion of flammable materials. Hydrogen is a highly flammable gas. What is Gas Correction Factor? The gas correction factor (GCF) is used to indicate the ratio of flow rates of different gases for a given output voltage from a mass flow controller (MFC). The basis gas is nitrogen (N2) which, by convention, has GCFN2 = 1. To calculate the mass flow of a gas for a MFC that is calibrated for a different gas, take the GCF of the gas being used and divide that by the GCF of the gas that the MFC was calibrated for. A MFC is calibrated for Argon (GCFAr = 1.39) and the gas of interest is CO2 (GCFCO2 = 0.70). The resulting effective GCF would be GCFCO2 / GCFAr = 0.70 / 1.39 = 0.50. 1. When using the GCF, the accuracy of the flow reading may vary by +/-5%. 2. The repeatability remains within +/-0.2% FS. Download the PDF document to learn more. Many flow rate controllers used for delivering gas phase reactant to fuel cells are mass flow controllers. A mass flow controller is designed to deliver an exact quantity of mass of reactant at a specific rate. This can lead to confusion as to the actual volume of reactant delivered because we usually express the reactant flow in terms of a volumetric rate, such as liter per minute (L/min) or cubic centimeter per minute (ccm). That is, we must always specify the mass (or molar equivalent) flow rate in which case one must use a standard volume flow rate. where the number of moles n (moles) can be replaced with the equivalent mass m by normalizing by the molecular weight M (gram/mole) of the gas. Therefore, one has to specify both temperature and pressure in addition to the mass of gas in order to determine the volume the gas will occupy. The temperature and pressure dependence of a volume of gas means that mass flow controllers must be defined at some standard state condition. The appropriate units are standard liter per minute (SLM) or standard cubic centimeter per minute (sccm). These units, SLM and sccm, are actually units of mass flow rate, which is consistent with the concept that we are dealing with mass flow control and not volume flow control. A common standard state condition used by industry is 0 °C and 1 atmosphere (= 760 torr). However, different mass flow controller manufacturers have different definitions of standard state conditions for their products (e.g., 1 atm, 25 °C). This amounts to a 9 % difference in volume flow rate in gas at these two temperatures. Note, however, the molar and mass flow rates are exactly the same. The difference in volume flow rate lies in the fact that the gas expands at higher temperature. By knowing the standard state conditions of the mass flow controller, fuel cell users can account for the difference in temperature and pressure of the gas the mass flow controller is exposed to relative its standard state conditions, allowing precise accounting and control of reactant stoichiometry and utilization. What can cause a low OCV (Open Circuit Voltage)? How does one identify the problem if the MEA in a single cell being tested does not reach a desired OCV? The OCV of most low temperature fuel cells operating on H2 and Air should be in the range 0.95 to 1.0 V and slightly higher under H2/O2. Lower OCV value indicates high reactant cross-over and/or electronic short through the membrane, or poisoning of the catalyst or electrolyte. For PEM fuels cells, a low OCV may also indicate total dehydration of the membrane. Linear sweep voltammetry of the cell under H2/N2 conditions can be used to diagnose the presence and magnitude of cross-over and electronic short through the membrane. Cyclic voltammetry of the cell under the same H2/N2 conditions can be used for in-situ analysis of the electrode catalysts, including the presence of poisoned catalysts or poor electrode properties. Both of these diagnostic methods and the analysis procedure are described in detail the Scribner’s book “Experimental Methods and Data Analysis for Proton Exchange Membrane Fuel Cells”. If there is an unexpected low OCV which is not explained by the information above, a volt meter can be used to verify the test system reading. To perform this check: Apply Fuel and Apply Temperature with the same settings as previous OCV measurement; disconnect the main load cables and sense leads from the fuel cell fixture; and measure the cell voltage with an accurate digital voltmeter. Ensure that the other cell hookups stay connected (fuel lines, vent lines, cell heaters, and thermocouple) during this test. There should be little or no measurable difference between the voltage on the meter and the voltage reported by the software with ‘Apply Fuel’ selected but ‘Apply Load’ not selected. If the readings agree, the low OCV is real and is likely related to MEA construction. If the voltage measurements do not agree closely, please contact support for further troubleshooting assistance. Why does the water consumption rate of the fuel cell test stand humidifiers decrease with increasing pressure? Does the relative humidity of the gas change with pressure, all else being equal? Setting up your first fuel cell lab? Download our PDF checklist. The article introduces the use of cyclic voltammetry (CV) for evaluation of catalyst utilization and electrochemical surface area of fuel cell electrocatalysts. A typical proton exchange membrane fuel cell (PEMFC) catalyst layer is a porous, three dimensional structure consisting of carbon support, platinum (Pt) or Pt-alloy catalyst and ionomer such as Nafion®, all in intimate contact. The carbon support enhances the bulk electronic conductivity of the electrode and dispersion of the catalyst nanoparticles. The ionomer serves to bind the electrode layer and facilitate proton conduction to the reaction site. Voids allow for mass transport of gas or liquid phase reactants and products to and from the carbon-supported electrocatalyst. The electrochemical activity (current/nominal area) of the catalyst layer is a function of the extent and quality of the three phase boundaries where reactants, ionically and electrically conducting material and active catalyst sites are in intimate contact. Electrochemical surface area and catalyst utilization are critical performance metrics for catalyst and membrane electrode assembly (MEA) developers and manufacturers. 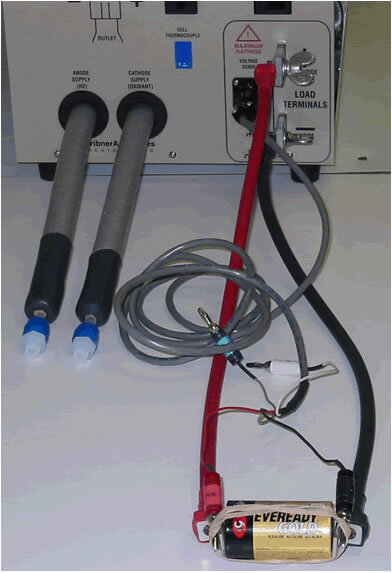 The technique for determining the electrochemical surface area (ECSA) of fuel cell electrodes by CV analysis has been used for several decades. The procedure involves cycling the electrode of interest over a voltage range where charge transfer reactions are adsorption-limited at the activation sites. That is, the electrode potential is such that the number of reactive surface sites can be obtained by recording the total charge required for monolayer adsorption/desorption. Figure 1 shows a typical CV voltammogram of the HAD reaction. The process of interest is the electroreduction of protons and adsorption of hydrogen on the catalyst surface, that is, reaction  in the reverse direction. The hydrogen adsorption charge density (qPt in Coulombs/cm2) due to this reaction determined from the CV experiment is used to calculate the ECSA of the fuel cell electrode. Figure 1. Cyclic voltammogram of PEM fuel cell catalyst layer for ECSA analysis by hydrogen adsorption/desorption. Conditions: Scan rate = 40 mV/s; Cell: 35 °C; 100% RH anode/cathode; 1 atm. Not all of the catalyst used to make the fuel cell electrode is accessible to reactants (e.g., protons and oxygen at the cathode) and/or is in electrically contact and thus is not able to participate in the electrochemical reaction. The fraction of the catalyst that is available to participate in electrode reactions is given by the ratio of ECSA to the specific area of the catalyst obtained by the catalyst manufacturer using chemisorption or other ex situ techniques (also in cm2Pt / gPt). This ratio is referred to as utilization. Higher catalyst utilization is better. Utilization is an idealized condition because the very low reaction rate used during the ECSA measurement results in negligible transport limitations. In a fuel cell operating at a practical current density, oxygen and/or proton transport resistances could decrease the amount of catalyst that participates in the cathode reaction4, effectively decreasing utilization. Fuel cell electrodes may be examined for their electrocatalytic performance by ex situ or in situ voltammetry experiments. In the case of ex situ experiments, also known as half-cell experiments, the properties of the electrode are evaluated using a standard three-electrode cell where an aqueous solution (e.g., perchloric acid) simulates the proton-conducting electrolyte in a PEMFC. Half-cell experiments are a convenient and relatively fast method of screening electrocatalysts but are not suitable for evaluation of fuel cell electrodes under operating conditions. In situ experiments use a two-electrode configuration in which one of the electrodes of the fuel cell serves as both a counter electrode and a pseudo-reference electrode. Typically, the electrochemical activity of the fuel cell cathode is of most interest because of the sluggish kinetics of the oxygen reduction reaction. Therefore, the cathode is often chosen to be the working electrode (WE). The fuel cell anode is used as the CE/RE with the inherent assumption that polarization of this electrode is small relative to the polarization imposed on the fuel cell cathode, the working electrode. The current densities obtained in the ECSA tests are relatively small and justify this assumption. The test conditions for in situ ECSA evaluation by CV are akin to those used for fuel cell crossover evaluation presented in a the Aug/Sept 2008 issue of Fuel Cell5. The fuel cell electrode of interest (the WE) is filled with water or slowly purged with a non-reactive gas such as nitrogen, while hydrogen is fed to the other electrode (the CE/RE). See additional comments on the effect of inert gas purge rates below. The potential of the working electrode is swept at about 20 to 50 mV/s first in the anodic direction to oxidize the adsorbed hydrogen Hads to H+ and then in the cathodic direction to electrochemically reduce the H+ back to Hads. Alternating anodic and cathodic currents occur at the electrode. Note that a fuel cell is a driving system whereas the ECSA measurement is a driven system requiring the use of a potentiostat or other controllable power supply. Results of the CV scan are presented as a voltammogram of current density vs. the working electrode potential (Figure 2). The voltammogram exhibits multiple peaks associated with both the oxidation and reduction reactions. Each peak is indicative of the adsorption onto or desorption from a particular crystal index of platinum, e.g., 100 and 110 indices1. Integration of the hydrogen desorption/adsorption peaks that result as a consequence of the forward and reverse scans, respectively, is used to estimate the electrochemically active surface area of the electrocatalyst. The shaded area in Figure 2 represents the charge density qPt arising from hydrogen adsorption on the Pt catalyst during the reverse sweep. where Cdl is the specific capacitance of the electrode double layer (Farad/cm2electrode). The electrical charge associated with double layer charging and fuel crossover must be accounted for in the analysis to avoid overestimating the charge attributed to the electrocatalytic activity. where C*dl,Pt and C*dl,carbon are the specific double layer capacitance (in F/cm2) for Pt and carbon, respectively, and APt and Acarbon are the area of platinum and carbon in the electrode (cm2/cm2electrode), respectively. The specific double layer capacitance for platinum was reported to be 40 µF/cm2Pt 6 and for Vulcan XC-72, a common catalyst support material, the value was ~ 8 µF/cm2carbon 7. From this, the specific area of the carbon catalyst support can be obtained using Eq. (3). Thus, properties of the catalyst support within the fuel cell electrode can be also be determined from in situ CV measurements of the electrochemical surface area of the fuel cell electrodes. Figure 2. Cyclic voltammogram of a PEMFC catalyst layer highlighting the region of interest. The shaded area is the charge density due to H adsorption during the reverse scan and is used in the ECSA calculation. Conditions as in Figure 1. • Both relative humidity (RH) of the gases to which the electrode is exposed, and the electrode temperature influence the observed ECSA. Fully-saturated or super-saturated (>=100% RH) conditions are generally used. • The flow rate of nitrogen or other inert gas at the working electrode can significantly influence the shape of the adsorption/desorption curve and calculated ECSA8. The artifact was attributed to the rate of mass transfer of H2 away from the working electrode during the voltage scan. With increasing N2 purge rate, H2 is more readily swept from the electrode surface, decreasing the partial pressure of H2 at the electrode thereby increasing the Nernst potential for hydrogen evolution. All else being equal, conditions that decrease the concentration of H2 at the WE increase the reversible potential for hydrogen evolution. As the potential at which hydrogen evolution begins to occur during the reverse scan increases, the more difficult it is to accurately quantify the hydrogen adsorption from the voltammogram. Low purge gas flow rate ~ 1 sccm/cm2 of active area may be preferred. • The HADS method is not suitable for metals such as Ruthenium which exhibit oxygen adsorption-desorption at potentials inside the hydrogen adsorption-desorption region; the contributions can not be separated. • The HADS method is not suitable for metals, such as Palladium, that absorb H, thus confounding determination of the hydrogen monolayer concentration. Alternative methods such as CO adsorption technique should be used. Electrochemical surface area experiments are an important diagnostic for fuel cell catalyst, electrode and membrane electrode assembly (MEA) developers and manufacturers. The ECSA should be determined when a new MEA and fuel cell is fabricated as well as periodically during testing as a diagnostic for fuel cell electrode degradation. The experiment should be conducted on membrane electrode assemblies that have been through a break-in procedure to fully active the electrode. Finally, ECSA measurements are used in RDE studies to ensure that catalyst has not fallen off during the RDE experiments. Acknowledgement – The author is grateful for the comments and suggestions provided by Vijay K. Ramani, Assistant Professor, Chemical Engineering, Illinois Institute of Technology. 1. K. Kinoshita and P. Stonehart, “Preparation and Characterization of Highly Dispersed Electrocatalytic Materials” in Modern Aspects of Electrochemistry, Vol. 12, Chapter 4, J.O.M. Bockris and B.E. Conway, Eds., Plenum Press: New York, 183-266 (1977). 2. T.R. Ralph, G.A. Hards, J.E. Keating, S.A. Campbell, D.P. Wilkinson, M. Davis, J. St-Pierre and M.C. Johnson, “Low Cost Electrodes for Proton Exchange Membrane Fuel Cells – Performance in Single Cells and Ballard Stacks,” Journal of the Electrochemical Society, 144, 3845-3857 (1997). 3. F. Gloaguen, J.-M. Leger and C. Lamy, “Electrocatalytic Oxidation of Methanol on Platinum Nanoparticles Electrodeposited onto Porous Carbon Substrates,” Journal of Applied Electrochemistry, 27, 1052 (1997). 4. K.C. Neyerlin, W. Gu, J. Jorne, J.A. Clark and H.A. Gasteiger, “Cathode Catalyst Utilization for the ORR in a PEMFC,” Journal of the Electrochemical Society, 154, B279-B287 (2007). 5. K.R. Cooper, “In Situ PEM Fuel Cell Fuel Crossover and Electrical Short Circuit Measurement,” Fuel Cell Magazine, Aug/Sept, 34-35 (2008). 6. A. Parthasarathy, B. Dave, S. Srinivasan, J.A. Appleby and C.R. Martin, “The Platinum Microelectrode/Nafion Interface: An Electrochemical Impedance Spectroscopic Analysis of Oxygen Reduction Kinetics and Nafion Characteristics,” Journal of the Electrochemical Society, 139, 1634-1641 (1992). 7. K.H. Kangasniemi, D.A. Condit and T.D. Jarvi, “Characterization of Vulcan Electrochemically Oxidized under Simulated PEM Fuel Cell Conditions,” Journal of the Electrochemical Society, 151, E125-E132 (2004). 8. R.N. Carter, S.S. Kocha, F.T. Wagner, M. Fay and H.A. Gasteiger, “Artifacts in Measuring Electrode Catalyst Area of Fuel Cells through Cyclic Voltammetry,” ECS Transactions, 11(1), 403-410 (2007). Ohmic resistance (Rohm) is a key performance driver of fuel cells [1, 2]. The three sources of ohmic voltage loss are (i) resistance to ion migration within the electrolyte, (ii) resistance to electron transport within the cell components (electrodes, gas diffusion layer, flow field/current collectors), and (iii) contact resistances. Although the dominate source of ohmic resistance varies with the type of fuel cell, the total internal resistance of a fuel cell (or fuel cell stack) is an important consideration: small amounts of ohmic resistance (on the order of milliohms) have a significant effect on overall efficiency because of the high current densities at which these electrochemical devices generally operate . As a result, it is desirable to measure the resistance of the cells during their development, manufacture and long-term operation. This article examines and compares presently available methods for measuring the internal resistance of fuel cells during operation. Because the resistance of the cell is often a complex function of many parameters (e.g., temperature, current density, hydration, etc.) it is desirable to measure the resistance of the cell under operating conditions. Therefore, we focus on methods suitable for on-line, real-time monitoring of functioning cells. The four methods generally used for internal cell resistance measurement are: Current Interrupt (iR), AC Resistance, Electrochemical Impedance Spectroscopy (EIS), and High Frequency Resistance (HFR). A comparison of these methods follows a discussion of the measurement principle, and the pros and cons of each. The fuel cell can be modeled by the equivalent circuit shown in Figure 1(a). This simple model circuit is commonly applied to electrochemical systems in which contact resistance and other effects are small enough to ignore. For simplicity, assume that the polarization resistance of one electrode (say the cathode) is much larger than that of the other electrode (the anode), so that one can legitimately omit circuit elements associated with one of the electrodes (the anode in this example). Polarization resistance is the reaction equivalent, double-layer capacitance is the interfacial capacitance of the cathode, and the ohmic resistance is the resistive component of the fuel cell to be evaluated. The voltage source element is an ideal DC voltage source (zero internal impedance and constant voltage) with a potential equal to the open circuit voltage of the fuel cell. The voltage source element does not affect AC analysis but allows the model to approximate the DC behavior of the fuel cell. Note that the values of these equivalent circuit components are a function of the cell’s operating current or voltage, making the fuel cell an electrically non-linear device. • All methods impose a changing electrical condition on the cell. • All methods measure current and/or voltage waveforms resulting from that change. • All methods require an accurate voltage measurement directly at the cell terminals using the four-terminal (Kelvin) method. Fig. 1: (a)Simplified, idealized equivalant circuit for a H2 PEM fuel cell. (b)Nyquist plot of the imedance of the equivalent circuit shown in (a). In this time-domain AC technique, the cell current is very rapidly interrupted and the terminal voltage before and during the interruption measured [3, 4]. The current interrupt technique is probably the most widely used method of ohmic drop and ohmic resistance evaluation of electrochemical systems, including batteries , corrosion [6, 7], and fuel cells [8-10]. The principle of the current interrupter method is shown in Figure 2. The cell voltage is a combination of the charged anode and cathode potentials less the cumulative resistive potential drop of the electrolyte, electrical conductors and contact resistances. Thus, in principle, the cell voltage rises nearly instantaneously by the amount of the ohmic potential drop, delta(V) (Volts), upon interruption of the current. The ohmic resistance of the cell Rohm (ohm-cm2) is determined as the quotient of the instantaneous change in voltage and the cell current density i (A cm-2) just prior to the interrupt event, Rohm = delta(V) / i. Advantages of this method include a single data value which is easily interpreted. Furthermore, there is no requirement for additional equipment because the interrupt is brought about by the load. The primary disadvantage of this method is that it imposes a significant perturbation on the cell, if only for a short duration (i.e., tens of micro-seconds). Users of this method are also cautioned that data is degraded when long cell cables are used due to excessive ‘ringing’ caused by cable inductance; leads should be kept as short as possible to minimize pick up of stray capacitances and inductances . Finally, under some circumstances for electrochemical systems with porous electrodes, the interrupter method may overestimate the ohmic voltage change and therefore overestimate the ohmic resistance of the cell. This latter point is discussed further in reference . This method uses an AC resistance measurement device, such as an external AC milliohm meter, to apply a single, high frequency sine wave (typically ~1 kHz) to the fuel cell under test to measure the total impedance magnitude of the cell and the load in parallel at that frequency. The set-up is shown in Figure 3. The ohmic resistance of the cell can be extracted after correcting for the impedance of the load. Like the current interrupt technique, this method provides a single data point. Because the AC perturbation is generally small relative to the DC current, the cell is minimally disturbed electrochemically by the measurement and therefore this method is suitable for interrogation of a functioning cell. However, accurate results from the AC resistance method require exact gain-phase characterization of the impedance of the load at the operating conditions of the fuel cell during the AC measurement. Knowledge of the complex impedance of the load is required because the milliohm meter measures the zero-phase condition of the parallel fuel cell-load combination, which does not necessarily equal the zero-phase impedance of the cell (i.e., referring to Figure 3 in this configuration the load has a complex impedance in parallel with the complex impedance of the cell). To accurately determine the high frequency resistance of the fuel cell one should account for the contribution of the impedance of the load to the impedance measured with the AC milliohm meter. As such, one must determine with external frequency analysis equipment the complex impedance of the load at the DC voltage and DC current of interest at the frequency of the AC resistance measurement. The difficulties of this technique stem from the milliohm meter not being intended to measure energy sources under load. In the HFR method to determine internal cell resistance, a small AC signal is applied to the electronic load to modulate the DC load current, as illustrated in Figure 4. The resulting magnitude and phase of the AC voltage and current response are measured by a frequency response analyzer. A single, high frequency is used, typically on the order of 1 kHz. This method is actually a subset of the EIS method described below wherein a broad range of frequencies are employed. Of interest is the real component of the impedance (Z’ or Re(Z)). HFR measurement minimally disturbs the cell from its operating condition, both in magnitude and duration, and therefore it is suitable for routine, periodic application during normal fuel cell operation. The appropriate frequency for an HFR measurement varies with the electrochemical system under study. Selection of the proper frequency is best accomplished by examining the phase difference between the AC current and voltage signals at a range of frequencies. It should ideally be the frequency at which the imaginary component of the impedance is zero (Im(Z) or Z” = 0) and therefore the cell is behaving in a purely resistive manner. In terms of a Nyquist plot, this condition exists when the impedance data cross the real axis (Figure 1(b)) at high frequency. Typical HFR measurement frequencies range from 1 kHz to 10 kHz. In any case, the same frequency must be used for valid data comparison. Note that the method for choosing the HFR frequency requires that the test system also have EIS capability. This is generally not a problem because a true frequency response analyzer can measure over a wide range of frequencies, so a test system capable of true HFR measurement will also be capable of performing EIS measurements. EIS is an extension of the HFR method previously described and differs in two ways. Whereas HFR employs a single frequency and only examines the real component of the impedance, EIS involves imposing the AC perturbation over a broad range of frequencies – typically 10 kHz to 1 Hz or lower – and monitoring the resulting variations in magnitude and phase of the cell voltage and current in order to determine the complex impedance (Z’, Z” or Z-phase relation) of the electrochemical system being studied. This results in a rich data set from which several parameters may be extracted via equivalent circuit modeling. These parameters include non-electrode ohmic resistance, electrode properties such as ohmic resistance and activation polarization resistance, double-layer capacitance, and transport properties [12-16]. The real component of the impedance measured using EIS at the frequency used for an HFR measurement should be identical to the resistance obtained using HFR. F. Barbir, PEM Fuel Cells: Theory and Practice. Elsevier Academic Press, Burlington, MA, 2005, pp. 39-45. J. Laraminie and A. Dicks, Fuel Cells Systems Explained. John Wiley & Sons, New York, NY, 2000, pp. 37-50. J. Newman, J. Electrochem. Soc., 117 (1970) 507-508. D. Britz, J. Electroanal. Chem., 88 (1978) 309-322. M. Hayes, A.T. Kuhn and W. Patefield, J. Power Sources, 2 (1977/78) 121-136. F. Mansfeld, Corrosion, 38 (1982) 56. H.P. Hack, P.J. Moran and J.R. Scully, in: L.L. Scribner and S.R. Taylor (Eds. ), The Measurement and Correction of Electrolyte Resistance in Electrochemical Tests – ASTM STP 1056, American Society for Testing and Materials, Philadelphia, PA, 1990, pp. 5-26. C. Lagergren, G. Lindbergh and D. Simonsson, J. Electrochem. Soc., 142 (1995) 787-797. C.-G. Lee, H. Nakano, T. Nishina, I. Uchida and S. Kuroe, J. Electrochem. Soc., 145 (1998) 2747-2751. F.N. Büchi, A. Marek and G.G. Scherer, J. Electrochem. Soc., 142 (1995) 1895-1901. K.R. Cooper, and M. Smith, J Power Sources, 160, 1088–1095 (2006). T.E. Springer, T.A. Zawodzinski, M.S. Wilson and S. Gottesfeld, J. Electrochem. Soc., 143 (1996) 587-599. R. Makharia, M.F. Mathias and D.R. Baker, J. Electrochem. Soc., 152 (2005) A970-A977. B. Andreaus, A.J. McEvory and G.G. Scherer, Electrochimica Acta, 47 (2002) 2223-2229. Q. Guo, M. Cayetano, Y. Tsuo, E.S. De Castro and R.E. White, J. Electrochem. Soc., 150 (2003) A1440-A1449. M.C. Lefebvre, R.B. Martin and P.G. Pickup, Electrochem. Solid-State Lett., 2 (1999) 259-261. Permeation of reactant from one electrode to the other through the PEM is referred to as crossover. Although crossover of both fuel (e.g., hydrogen or methanol) and oxidant (oxygen) occurs, the latter generally occurs at a lower rate and thus most often fuel crossover is the property of interest. Reactant crossover is important because it degrades fuel cell performance, efficiency and durability. Direct reaction of hydrogen with oxygen at the fuel cell cathode decreases the cell’s open circuit voltage through generation of a mixed potential. Fuel efficiency is also lowered because although the reactant is consumed, the electrical work is not captured. In addition, severe crossover autocatalytically accelerates membrane degradation and pinhole formation via locally generated heat leading to proximate membrane thinning, which further accelerates the crossover process. The rate of crossover is determined by the reactant’s permeability through the membrane. For a given reactant, it is a function of the membrane composition, microstructure and thickness, as well as environmental parameters. Permeability is the product of diffusivity and solubility and therefore factors impacting these properties influence crossover rate. For example, the crossover rate increases at elevated temperature in part because diffusivity increases with temperature. All else being equal, a fuel cell with a thin membrane will exhibit higher crossover than one with a thick membrane because the concentration gradient of the reactant across the membrane that is the driving force for diffusion is larger. Similarly, direct conduction of electrons between the electrodes through the electrolyte is also a source of loss within a fuel cell. Although the electrolyte is designed to be an ionic but not electronic conductor, finite electrical shorts between the electrodes may occur as a result of electrolyte thinning (cell electrical resistance typically decreases with age) or as a result of pinhole formation. As with crossover, excessive electronic conduction through the electrolyte results in degradation of cell performance. Fuel crossover and internal short circuits are essentially equivalent in terms of impact on efficiency. The crossover of one hydrogen molecule resulting in the loss of 2 electrons is the same as the loss occurring from the conduction of 2 electrons from the anode to the cathode. Fuel crossover of 1 mA/cm2 equates to a loss in current efficiency of 0.25% at an operating current density of 400 mA/cm2. In Situ Fuel Crossover Measurement – To experimentally determine the fuel crossover, a suitable inert gas such as nitrogen is used to purge the fuel cell cathode while hydrogen is passed through the fuel cell anode. The potential of the fuel cell cathode (i.e., the working electrode, WE) is swept by means of a linear potential scan to potentials at which any hydrogen gas present at the fuel cell cathode is instantaneously oxidized under mass transfer limited conditions. Such experiments are referred to as linear sweep voltammetry (LSV) [see Bard & Faulkner 2001 or other texts on electrochemical techniques for a discussion of LSV]. Note that an operating fuel cell is a driving system (current source) whereas the electrochemical crossover measurement is a driven system (current sink) which requires the use of a potentiostat or other controllable power supply. The working electrode is scanned at 1 to 4 mV/sec from the open circuit potential (~ 0.1 V) to ~ 0.8 V vs. the counter/reference electrode (CE/RE) using a potentiostat. Polarization to anodic potentials > 1.0 V can lead to irreversible damage of the fuel cell electrode resulting from carbon corrosion and catalyst oxidation. Fully or super-saturated (> 100% RH) conditions are generally used for both the fuel and inert gas. Methanol crossover can also be determined using this basic voltammetric method, with the hydrogen being replaced by the liquid fuel [Ren 2000]. where ilim is the transport limiting current density (A/cm2), n is the number of electrons taking part in the reaction (electron-mole/mole), and F is the Faraday constant (96,485 C/electron-mole). The rate of H2 crossover from the anode to the cathode through the membrane is proportional to the mass transport limited current density. The current typically attains either a constant or linearly increasing value with increasing electrode potential. A constant, electrode potential-independent current is indicative of a fuel cell with a very high (infinite) electrical resistance (i.e., no internal shorting) whereas a linearly increasing current indicates that the cell has a finite resistance due to internal shorting. The electrical resistance of the cell can be estimated from the slope of the voltage vs. current plot. Crossover experiments an important diagnostic for membrane and membrane electrode assembly (MEA) developers, manufacturers, and integrators, and should be conducted whenever a new cell is assembled and periodically during testing. A crossover threshold is often used as end-of-life criteria in membrane durability testing. Bard, A.J. and Faulkner, L., Electrochemical Methods: Fundamentals and Applications, John Wiley & Sons: New York, NY (2001). Ren, X., Springer, T.E., Zawodzinski, T.A. and Gottesfeld, S., “Methanol Transport Through Nafion Membranes – Electro-osmotic Drag Effects on Potential Step Measurements,” J. Electrochem. Soc., 147, 466-474 (2000). Q: I want to multiplex impedance measurements in the time domain between 4-8 working electrodes. Do you sell multiplexers that will do this? The 1281 has eight cell cables, one for each cell. It is normally used with independent cells to do multiple electrochemical experiments at once. You could do this on a single cell (single counter, single reference) with multiple working electrodes by connecting the counter electrode lead of all 8 cell cables to your cell’s counter electrode and all of the RE1 leads to the cell’s reference electrode. Each cell cable’s working electrode lead connects to one of the cell’s working electrodes [up to 8]. If you need to do EIS on an electrochemical cell with up to 100 working electrodes, you can instead use our Model 910 MMA. It is, however, intended for arrays of small electrodes so the maximum current per working electrode segment is limited to 100uA or less, depending on system configuration. The Model 910 also has a frequency response limited to 1kHz. One advantage of the Model 910 is that the potentiostat, FRA, and multiplexing functions are all contained in one small bench top instrument. The Model 910 is controlled by our MMALive software. For either approach, the impedance data can be analyzed post-measurement with our ZView software. How is current interrupt (iR) performed? Q: How is current interrupt (iR) performed? The data is displayed and valid only when a current is applied that is large enough to make the voltage difference between steps 1 and 3 above a minimum value. The current interrupt process is suspended during impedance measurement experiments. Is the ohmic overvoltage measured automatically by the iR technique during an experiment? Does E_iR_Stack Read in FCView correspond to the ohmic overvoltage? The current interrupt cell resistance measurement is running and displaying data whenever the current is large enough to produce a measurable voltage difference during the interrupt. This is the case during Background operation of the software or if an experiment is running. For the current interrupt data to be saved to data files during background recording or during an experiment, the iR Comp Potential, iR Drop, or iR (mOhm) data values (in the right side of the FuelCell software window) must be checked. These values with checked boxes will be visible in FCView. Ask us or refer to the FuelCell Help menu for more details. Is the capacitive or double layer charging current of a fuel cell constant during a CV scan? The double layer charging current arises because of the capacitive-like nature of the electrode/electrolyte interface. The current (I) through a capacitor is given by the product of the capacitance (C) and the rate of change in voltage (dV/dt): I (Amp) = C (Faraday) x dV/dt (Volt/sec). The double layer charging current will be constant if dV/dt and C are constant. If the intrinsic capacitance of the interface is a function of voltage, than the double layer charging current would change. The more likely source for what appears to be a changing double layer charging current is an electrical short in the cell. The region in which the double layer charging current dominates the CV scan (0.4 V to ~0.75 V) will not be constant (flat line on a plot I vs. V) if the fuel cell has an electrical short. In this case, Ohm’s law tells us that there will be increasing current shorting between the electrodes as the voltage between the electrodes increases. The observed current is the sum of the double layer charging current, current shorted through the fuel cell (and any Faradaic current). The short would result in a linearly increasing current observable in what is normally attributed to the “double layer charging” current. Will AgCl or other reference electrode bias effect EIS data? The DC reference potential will have no effect on the impedance data. The DC half cell voltages (displayed as Ref1 and Ref2 in the Data List) will however reflect a shift of 0.197V (for AgCl). The Bias Rejection in the 850e is -10 to 10V for the Ref1 and Ref2 signals and -25 to +25V for the Whole Cell voltage. When measuring impedance, it subtracts the existing DC voltage from the signal before passing the signal on to the FRA to be analyzed. The is redone for each data point, and in fact the bias rejection is performed separately for the Whole Cell, Ref1 and Ref2 voltages since these will have 3 different DC voltages. The Bias Rejection is also performed on the current signal because it typically has a large DC component which must be removed before the FRA receives the signal. An application note by Emma Dedmond and Dr. Kevin Cooper entitled Effect of Solution Conductivity on IP Membrane Conductivity Data. Outlined is a procedural example using the BekkTech BT-110 Conductivity Clamp to test membrane materials in a bulk-solution. Please see the paper here. Provides instructions for the setup and operation of a Scribner Associates 850e Fuel Cell Test System, 885 Fuel Cell Potentiostat and BekkTech BT-112 Conductivity Cell for in-plane measurement of PEM resistance and conductivity as a function of RH and temperature. Describes and Summarizes Durability Test Protocols for PEM Fuel Cells. Describes calculations of gas stoichiometry factors. Describes recommended Start-up and Shut-down procedures. Describes setup and operation of Model 892 Data Expansion System with FuelCell. Describes implementation of Model 895 Auto Back Pressure Module in FuelCell. Describes definition and configuration of alarms and alarm actions in FuelCell. Describes the use of new termination actions in the Arbitrary Control Experiment in FuelCell. Describes FuelCell configuration for use with up to 16 auxiliary controllers. Describes auxiliary digital output controls implemented in FuelCell. Describes a method to use Main and Reformate mass flow controllers to switch between O2 and Air for the Cathode gas. Q: Can I setup my Scribner fuel cell test system (850/855/890) and FuelCell software for stoichiometric flow control of my fuel cell? (N2) concentration for mass transport limiting experiments. Describes the CorrWare experiment implementation in FuelCell. Describes how to adjust the number of significant digits used to display measured current values. Describes use of dual range MFCs. Parallel combination of a small range MFC and large range MFC facilitates accurate control of low flows with large flow capability. Describes use of a function in FuelCell that will limit the size of data files by creating multiple files using the same base file name. Describes compensation of control loop attenuation in the 850/890 loads by boosting the generator amplitude at higher frequencies. Describes Manual Installation of the two 850 / 890 Test Systems on a single computer. Describes how FuelCell will suppress the display of iR Drop and iR resistance for small iR voltage drop. Describes use of a parallel combination of a small range MFC with a lager range MFC for accurate control of small flows with large maximum flow capability. Describes use of multi-range mass flow controllers for reformate gases. Describes automated back pressure control implementation in FuelCell. Describes how Arbitrary Control experiments can be used to trigger events via a separate external program. Describes an optional function that will control the Standby Mode. The Standby Mode is a special alarm mode where an alarm signal causes the Load Unit to apply a user-specified current until a user manually resets the system. Describes FuelCell software configuration for use with a Teledyne cooling system. Describes configuration of FuelCell for temperature ramping at a specified rate to a setpoint. Defines and gives examples of the 4 modifiers used when setting voltage and current setpoints: Absolute, Vs. Open Circuit, Vs. Previous, Vs. Initial. Describes configuration in FuelCell for internal reformation using a liquid pump and fuel source. Describes wet/dry gas solenoid control implementation in FuelCell for 850 Fuel Cell Test Systems. Describes the wet/dry gas solenoid control implementation in FuelCell for 890 Fuel Cell Test Systems. Dr. Kevin Cooper demonstrates the ease of installation for Scribner Associates’ model 850e turn-key fuel cell test system. This video covers physical installation of the unit, proper connection and venting of the subject fuel cell, and installation of Scribner Associates’ ground-breaking FuelCell© software. Installing the Scribner Associates 885 FC Potentiostat for your 850e Fuel Cell Test System. A walk-through of fuel cell membrane sample loading and use of the Scribner 740 Membrane Test System.